The RollerNode™ RN-12v-10w-0 unit is an Arduino compatible LED companion controller for our radio equipped shade and blind motors. An RF (Radio Frequency) signal is used for transmission of the remote control signal, capable of passing through walls, and in most cases can reach anywhere inside a typical home. A small antenna receives the control signal from the multi-channel remote control and a microprocessor then uses the decoded signals to activate the LED lighting (and optional motor output). The optional 'MiniMight™' reversing motor controller can be used to operate devices that have a reversible 12v DC motor, such as our 12v window openers. The MiniMight™ motor controller can also be re-purposed and used to control other devices (such as relays) by reprogramming the Arduino microprocessor with a laptop or similar device. This will be covered in the advanced instructions for reprogramming the microcontroller; it is a simple procedure that essentially sends a text file (downloaded from our website) through the USB port to the Arduino microprocessor onboard the RollerNode™ unit. You can also extend your system to work with phones, tablets, PC or any other web enabled device, whether at home or away (and continue using your original hand held remotes in your home). The Vera™ system also supports Z-Wave™, Insteon™, x10™ and other control protocols, and it can be added at any time - you do not have to purchase it at the outset. Please see this article for further information: Vera™ control system. The most important item for installers are the 2 main screw terminal blocks: a 10 position unit for general connections (numbered 1 to 10), and a 2 position unit (numbered 11 & 12) for the dedicated PWM LED dimmer output. It is the PWM (Pulse Width Modulation) that provides a nice 'soft start' effect where the light intensity is gently ramped up to full (or half) brightness. When an off command is issued with the radio remote, the light intensity is gently ramped down, until it is turned fully off. Please note this is an 'open collector' design, which means the ground side of the LED connection is modulated to produce the soft start and dimming effects. Positive 12 volt DC power input, from external battery or power supply. Negative 12 volt DC power input, from external battery or power supply. Positive 12 volt DC output (self-resetting fuse triggers at 11 amps, resets at 7 amps). The positive lead from your LED lighting circuit would be connected here. +5 volt DC regulated output from pin 27 of the Arduino Nano, if you need to power external circuitry. 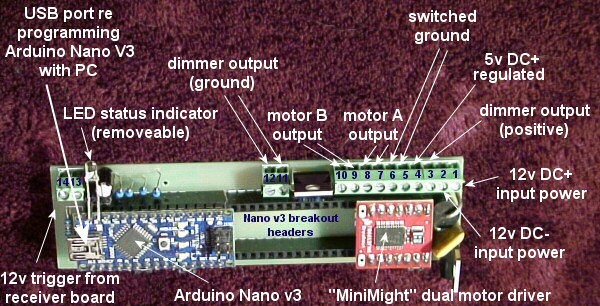 This is also available on the breakout headers, as is the 3.3v regulated DC output from pin 17 of the Nano v3. Switched ground from power supply. This line is interrupted when the auto-off circuitry is triggered and will shut off anything connected here. Switched ground from power supply, same as pin 5. LED ground connection. The negative lead from your LED lighting circuit would be connected here. LED ground connection, same as pin 11. Trigger signal from RF remote control receiver board. This is not normally touched, but could be used with an alternate external 12v trigger signal. Trigger signal from RF remote control receiver board. Pins 13 and 14 reverse polarity, depending on whether UP or DN signal is transmitted from remote. The LED status light header accepts any ordinary LED, and can be used to monitor the state of the controller; it operates in parallel with the status LED on the Nano v3 board, and is powered from pin 16 of the Nano board (referred to as D3, digital pin 13). We provide the header so you can insert an LED and drill a small hole to extend it through the lid if you want a visual indication of the controller status. Locate the setting switch (at the top middle of the receiver carrier board). Press and hold it for a few seconds until you hear a series of short beeps. Set the remote to the channel you wish to assign, then press the 'confirm' switch to activate the pairing. You will hear another series of confirmation beeps, indicating that the channel assignment is complete. As a convenience, each motor is automatically assigned to the ALL group when it is paired with another channel. There is no need to assign it separately. Press and release UP button on remote, unit turns on, status light flashes, soft start LED on sequence commences and ramps up to full brigtness. If the optional 'MightyMight' motor board is used, the motors are turned on for one minute, which would allow a blind or window opener to deploy to its travel limits. If the UP button was pressed and held for a second or so before release (or held down), the LED will ramp up to half brightness and the status LED will flash twice when this condition is reached. If the DOWN button is pressed at anytime during the UP sequence, the startup operation will be immediately canceled and the unit will turn off. When the unit is on at full or half brightness, press and release the DOWN button to begin shut down sequence. The LED will be dimmed until it is extinguished. 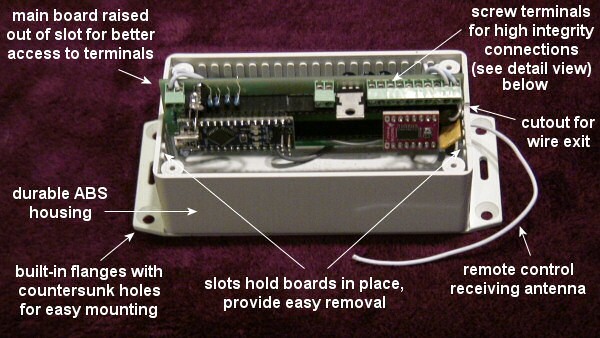 If the optional motor board is being used, the motor(s) will be reversed for 1 minute, then shut off. This will allow a blind or window opener to retract to its other limit. When the unit is on at full brightness, press and hold the DOWN button for at least 1 second to dim the LED lighting to half brightness (status LED will flash when LED array reaches half brightness). The motors will not be activated. 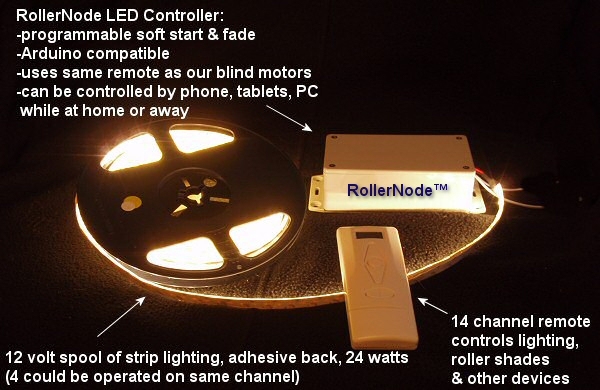 The RollerNode™ LED controller comes pre-programmed as above, so if you like 'easy', you need to do nothing more except make the connections described above. Please see Part 3 for the start of a discussion of its advanced capabilities.